Pink Lemonade: Cherry Limeade Anyone? While it is not exactly Pink Lemonade...it sure is close!!! 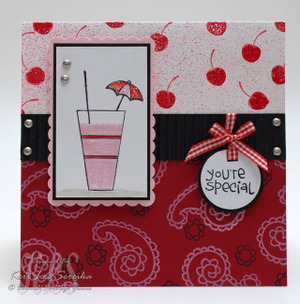 This card was done using three of Kim's new sets together...see how versatile they are? and the Paisley, Little Flower, You're from "You're A Hoot" and Special from "Somebirdy Special" from the Pretty Birds Set... The cherries are embossed using CHF's Cherry Chirp Scented Embossing Powder. Now I want to go to Sonic and have a Cherry Limeade!!!! Who's Buyin???? ?